Which is the Best Travel Backpack for Europe? Choosing a backpack is an important task. But how do you decide between them? Read my buyer’s guide to the best backpacks for backpacking Europe and how to choose the best travel backpack for Europe to help you plan the perfect trip. Good to Know: What Size Backpack for Traveling in Europe? Fairview 40) as the best backpack for travelling Europe for a number of reasons. Osprey excels at making high-quality backpacks and the Farpoint 40 is no exception. This is my go-to carry on backpack for travelling in Europe thanks to the fact it’s light, supportive and comfortable to carry around. The Farpoint 40 weighs a measly 1.77kg (3 pounds), making it the lightest of all of Osprey’s backpacks. The weight of your backpack might not sound like a big deal. That’s until you’ve been walking around with it for what feels like days on end. At that point, you’ll be grateful for every gram you’ve saved, I know I am. The light weight also has the added bonus of meaning that you can use the Osprey Farpoint 40 as a hiking backpack. There’s nothing worse than an uncomfortable backpack. The stabbing pain between your shoulders as you try and shift position to even out the weight is the fear of every backpacker. Osprey has used its experience in designing practical and comfortable outdoors gear to make the Farpoint 40 as snug as possible. Say hello to the cushioned carry handles, waist and chest strap, padded shoulder straps and the nifty hip belt and harness system. Together they are what makes the Farpoint 40 so comfortable to carry around. It’s important to note that this is a panel loading backpack. I definitely prefer these as they provide easy access to your belongings. There is an extra zip that gives you access to the main compartment, with even more storage space that you will ever need. Pockets-wise, there’s even a small top pocket for quick access to your all important essentials (like your camera for all those important photos! ), and side pockets. Add to that a plus a dedicated sleeve for your laptop. The main compartment contains a mesh pocket at the bottom, perfect for separating dirty clothes and shoes from the rest of your things. And you can rest easy that all your belongings are safe in those busy cities, as the zip is lockable. If you’re not bothered about travelling carry-on only or want to pack some larger items, the Farpoint also comes in 55, 70 and 80-liter sizes. Most budget airlines in Europe charge for checked luggage, so beware that a larger backpack will cost you more to travel around with. Each capacity backpack comes in two sizes for even better fit: S/M and M/L. Osprey recommend S/M for those under 5ft 6” and M/L for those above that height. Final thoughts: A great backpack with lots of storage options and offering superior comfort at a reasonable price. Deuter ACT Lite 60+10 SL is another fantastic backpack and a better choice if you are planning on travelling in Europe for a long time or are bringing a lot of travel gear for different activities. The larger the pack, the more important it is that it’s lightweight – your belongings will weigh enough without adding a lot of weight from the backpack itself. Though it’s significantly larger than the Osprey Farpoint, the Deuter ACT Lite only weighs 1.75 kg / 3lbs 14oz. No matter how light your backpack is, it’s not going to feel comfortable unless it fits properly. I’m a huge fan of the ACT’s aircontact suspension system, which helps the pack to adapt to each wearer’s back and hold the pack load close to the centre of gravity. Backpacks often make you sweat quite a bit, particularly in warmer climates. The Aircontact system helps with making sure that air circulates freely through the breathable pads on the back and the hips. The result is that air circulates through the pads every time you move. According to Deuter, this results in 15% less perspiration than with other body-contour backpacks. While I can’t attest to the percentage of sweat saved, I have noticed that the pack does feel more breathable than others when you are wearing it in hot weather. The Deuter ACT Lite 60+10 loads from both the top and the bottom. Although I generally avoid top loading backpacks, the additional bottom access does make it a lot easier to find your gear. I’d still prefer it if this was a front-loading backpack though. The backpack has got countless pockets: there are pockets on the lid, on the front, and even some on the hip belt, plus a pocket for your water bottle. The pocket on the front is pretty generously sized, doubling up as some extra storage space for when you have overpacked just the tiniest bit. The Deuter ACT Lite’s design is simple and uncluttered, and each component is finished to a very high standard. The backpack is 60 litres at standard size, however this stretches to an extra 10 litres by extending the hood. I really do struggle to carry anything larger than 70 litres when packed to capacity for long periods of time, so I’d urge you to consider how much you can realistically carry before you buy your backpack. I think that the Deuter will be large enough for most of you, but it’s up to you. The Vango Freedom is one of the best selling travel backpacks on Amazon, thanks to its nifty design, durability and lower price. Not content with this, Vango have released an updated version of the bag, the Vango Freedom II, which is an even better Europe travel backpack. Holding a total of 80 liters, the Vango Freedom II 60+20 is another one of the best backpacks for traveling in Europe for a longer backpacking trip. What I really like about this pack is the fact that it comes with a detachable daypack for added practicality. No doubt about it, the Vango Freedom II isn’t the lightest pack. Though the new design has shaved some weight off (2.92 kg compared to 3.05kg), this is still weighty when compared to other packs such as the Osprey Farpoint 40 and the Deuter ACT. Then again, the heavier weight isn’t really a surprise when you consider that the Vango Freedom II is really 1.5 backpacks, taking the daypack into account. Comfort wise, this is another winner. The Quick Adjust back system does exactly what it says – allowing you to tweak it while you’re on the go. This adjusts the pack’s placement and distribution on its internal frame, for a more comfortable carry. The ergonomically padded hip belt is shaped for the optimum load transfer and comfort. In addition to this, there is AirMesh on the straps of the backpack, which allow air to flow and keep you cool. I think that Deuter’s mesh is more pleasant to the touch – the Vango’s feels a little uncomfortable on bare skin, but not irritatingly so. The Vango Freedom II has a full length zip opening – so no digging around in the dark, or emptying your whole bag out to search for a pair of socks. It’s easy to see what’s where. I like the fact that you have one large compartment inside the bag, as I use packing cubes to organise my belongings and find it easy to fit them inside. The single compartment might not be so useful if you don’t use packing cubes though. The daypack is a good size to use as hand luggage and has enough pockets to make it a practical choice for travelling. There are also external pockets for those items you need to get to quickly without rummaging in the main compartment for. I’ve reviewed the Vango Freedom II 60+20, but you can also buy the Freedom II 80+20 if you are looking for a really large pack. Here’s another one of the best packs for Europe from Osprey, but this one is specifically designed for women. The Osprey Aura weighs 4.38 pounds or 2.1kg. It’s not the heaviest pack in this list, but it’s not the lightest either. I’m guessing a lot of the weight comes from the numerous internal pockets and storage options that distinguish the Aura from its rivals. Men and women have different body shapes and their weight is distributed differently, so it makes sense that Osprey have created a travel backpack for women. The Aura is designed to mould the female back and hug your body with its padded and adjustable shoulder, hip and front straps. I did find the Aura incredibly comfortable. Once I’d adjusted the straps it felt supportive and really easy to wear, even for long periods of time. 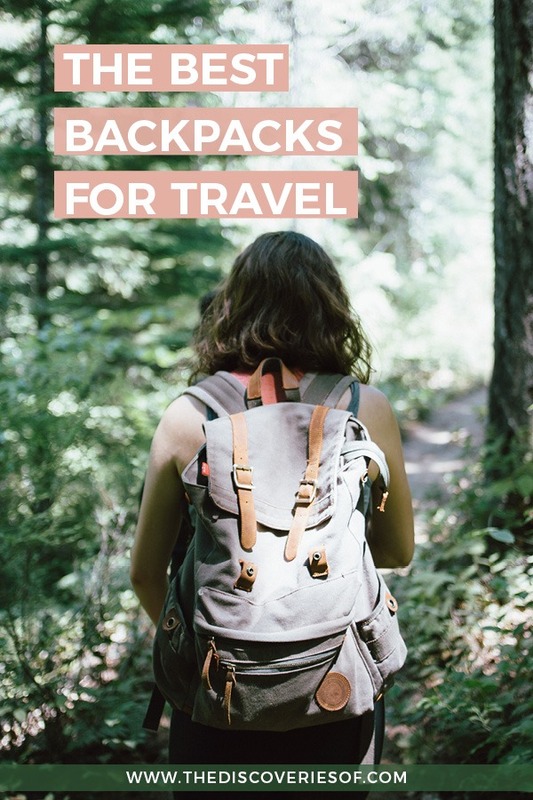 This is particularly relevant when you are backpacking to lots of destinations across Europe – you’d be surprised how long you end up carrying your pack for at times, not to mention when you set out to tackle one of Europe’s stunning hikes. The Aura is equipped with the suspended AntiGravity back system which is incorporated with the world’s first fully ventilated hip belt. So while other backpacks have ventilation on the back and straps, this backpack has the additional ventilation to reduce perspiration. Anyone who’s ever suffered the indignity of being covered with large sweat patches after removing their backpack will understand the benefit of this additional breathability. The main backpack compartment is accessed through the top and bottom, rather than the front, which is a bit of a bummer. It did mean it took longer to get to things in the Aura than in other backpacks. Can you have too many pockets? I think that the Aura’s nine pockets tread the fine line between having a useful number and so many that it’s a bit confusing. There are zippered pockets on the lid, base, side and a deceptively large one on the front. There’s even a sleeping bag compartment should you need one. Like all of Osprey’s backpacks, the Aura comes in a number of sizes. I’ve reviewed the 65 because it’s roomier than the 50 (which can’t be used as a carry-on anyway). Even if you are planning on travelling relatively light, it might be worth buying the larger 65 rather than the 50 as it gives you more flexibility for future trips. Final Thoughts: The most comfortable backpack I tried but I really prefer front-loading packs. The Kelty Redwing is a solid carry on backpack that is nifty enough to double up as a daypack for travelling in Europe thanks to a sensible design that really maximises the available space. There are some downsides to using your carry on backpack as your daypack too. For me, the biggest is the fact that you need to empty out your pack every time you want to use it during the day – a bit of a pain. But, it does mean that you will be travelling super-light and are unlikely to have to pay any baggage fees to fly between countries. The Kelty Redwing is a brilliant answer for those looking to start single-bag travel. The Redwing 40 is incredibly light. It only weighs 2 lbs 10 oz / 1.2 kg – good news whether you are using it as a daypack or a carry on backpack. On the comfort side of things, the Redwing has Hex Mesh on the back panel, shoulder straps and waist belt, and the back panel is also padded and ventilated. All of these features help to keep the backpack breathing against your skin and the air to flow in order to keep you cool and reduce your perspiration. When you are travelling with a 40 liter pack, it’s important to know that you can maximise the pack’s capacity. I was amazed by how much I could fit in the Redwing – it felt like you could fit the same amount you’d put into a 50l pack without putting any strain on the pack at all. Watch out for this though: if you’re travelling carry on only in Europe, many of the airlines have weight as well as size restrictions for cabin bags. Don’t pack the Kelty too full! There are endless compartments to keep you and your belongings organised – dual side pockets, front and top pockets, a water bottle holder, a laptop sleeve in the back of the main compartments, and even a carry handle. The U-pocket on the front is perfect for all of your belongings that you may need to access quickly, such as your camera or sunglasses. Final thoughts: A solid carry on backpack with lots of well-organised space. A 40 liter backpack is the best size for traveling in Europe as it’s small enough to fly carry-on only. If you aren’t up to the challenge of travelling with a 40 liter pack, you just need to make sure that you choose a backpack you will be comfortable carrying for long periods of time. So there we are: the best backpacks for travelling Europe. Now it’s time to go and have an adventure. Love this? Save it and share on Pinterest. I bought and tested a bunch of women’s travel backpacks and unfortunately found that many of them were too long in the torso for me at 5’3″! That’s interesting – what’s your workaround? I’m taller so haven’t had that issue but you definitely can’t be the only one that has found that. There are a few backpacks that have adjustable harness height, and those were my favorites! I ended up choosing the Thule Versant 60L for that reason. Sadly the excellent option from REI has been discontinued, but Osprey just released a Womens-specific pack that comes in a shorter size. Another option is to buy a hiking (rather than travel) backpack, as those tend to be available in more specific sizes like XS and S.
Really useful to know, thanks for sharing your tips!